Just kidding, it’s good again. Actually, coffee was always good, they were just confused for a little while. I admit, I’m one of those morning zombies that needs my cup of java before you may want to address me. My family knows this, and my husband is kind enough to have it ready for me each day when I wake up. But studies show that we may be benefiting from more than just the energy-boosting caffeine in coffee, we might also be reaping its cancer and stroke preventing benefits, just to name a few. Of course, as with all good things, moderation is key. All that caffeine can be addicting. Coffee is versatile. Did you know that besides it’s health benefits, coffee also gets rid of odors? It’s true, professional “noses” often use it in between sampling different fragrance notes to help distinguish the latest scent from the previous one. You can hide coffee beans discretely throughout your home to absorb odors. They’re very effective and will cost you less than other deodorizers. lingering on our hands, afterwards. After using my soap, you can go to the movies without anyone knowing you just cooked the most fabulous fish dinner! this on my thighs, as well. Yup, caffeine is the active ingredient used in most cellulite-reducing creams, (personally, I think all the massaging helps, too) check it! My soap is made with double-brewed coffee instead of water. I added some black-coffee fragrance oil and peppermint essential oil, too. It’s also got coffee grounds, dried citrus peel and oatmeal to gently scrub odors away, while leaving your skin clean and silky soft. 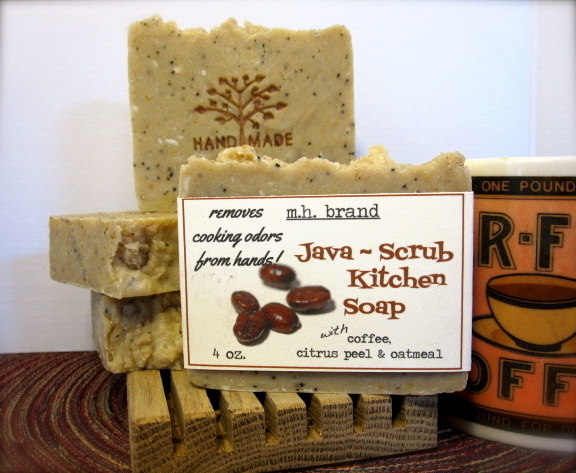 Posted in My Hand-Made Soap and tagged caffeine, cellulite, coffee, coffee soap, cooking, dried citrus peel, essential oils, food, oatmeal. Bookmark the permalink.